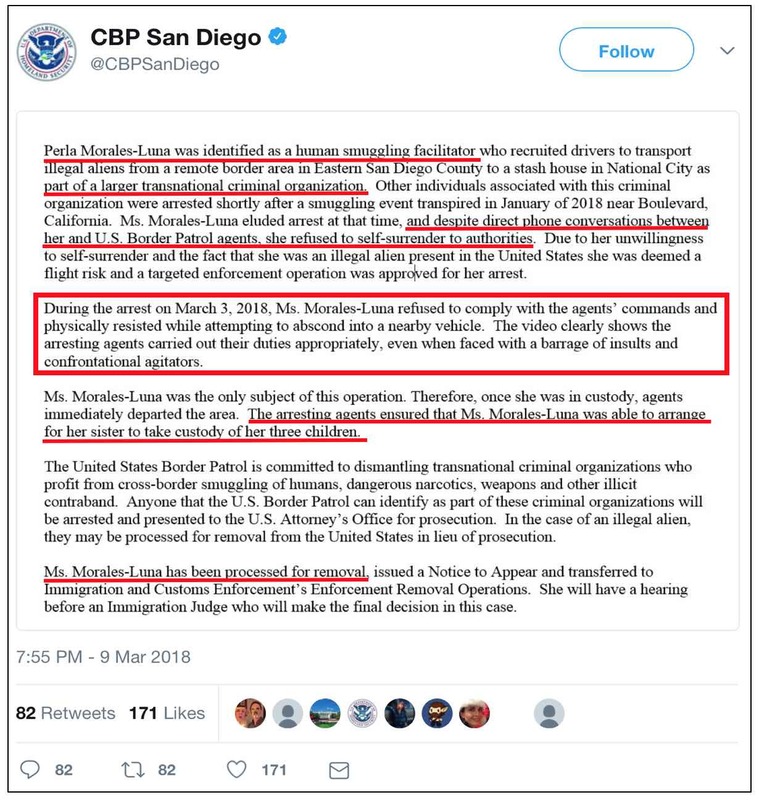 Leftists finally think (erroneously) they have a game-changing incident involving a Border Patrol apprehension of an illegal immigrant. A week ago, Perla Morales-Luna was arrested in front of her crying daughters in National City, California. Someone videotaped the incident. The video has gone viral. What most early press reports failed to note, or buried deep in their stories, is that the woman refused to be taken peacefully and in private. One unusual exception was a Friday evening Associated Press story. Many people who only see these headlines will believe that this was an abusive incident. The U.S. Border Patrol said Friday that agents acted appropriately during the videotaped arrest of a woman who was pulled away from her anguished daughters on a street in Southern California. The agency said 36-year-old Perla Morales Luna recruited drivers to take people who crossed the border illegally to a house in National City, near San Diego. The agency put her in deportation proceedings and is not pursuing smuggling charges. Video of the woman being pulled from her daughters on March 3 in the San Diego suburb had drawn nearly 10 million views on Facebook by Friday afternoon. At least one person can be heard crying uncontrollably as agents forced Morales-Luna into a vehicle and drove away. The woman's attorney, Andres Moreno II, said agents left the daughters — 17, 15 and 12 — alone on the street. The children, all U.S. citizens, are now living with family in the San Diego area. AP reporter Elliot Spagat clearly decided not to describe Morales-Luna's alleged involvement in human smuggling as, well, human smuggling. Morales-Luna arranged for her sister to take custody of her children but not until after agents whisked her away, according to the Border Patrol. The agency said officers faced "a barrage of insults and confrontational agitators" during the arrest. Michael Scappechio, a spokesman, said safety concerns prompted agents to leave before letting Morales-Luna call her sister.